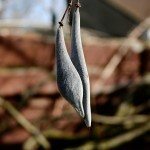 I read your very informative article on planting wisteria pods. I learned almost all I needed from it. However, I live in Texas where it's much warmer. Do I have to wait till spring to plant my seeds? Since they're dangerous to have around, and because I just want to, I'm anxious to get them planted ASAP. I had a very successful, huge one in the town I just moved from. It looked like a giant duck. I harvested all its pods before we moved. Just to be on the safe side, I would wait. You can, however, start them indoors. By the time they're big enough for planting outside, it should be ok to do so.